Oh dear! We’re all familiar with the tales of Little Red Riding Hood and The Three Little Pigs, but it seems that something has gone a bit awry in Fairy Tale Land. J.A. Early Riser and T.J. Crayons, along with some of the Maniacal Confessions news team, have entered the land that was once populated with Happily Every Afters. They bring us news of law suits, grim tidings of beloved characters disappearing, and other sensational stories. Risking life, limb and libations, the reporters have searched out all the secrets of the Rich and Famous, so that we can know the truth! 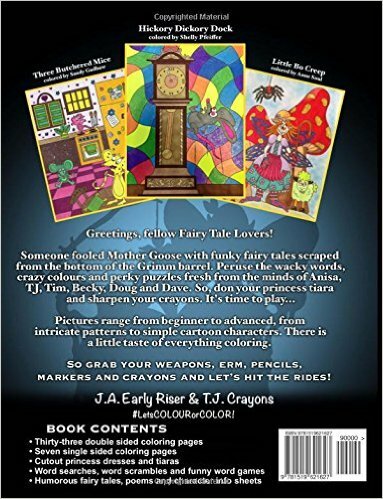 Editor’s note: This review is for the “Coloring Activity Book,” which has word searches, word scrambles, and other activities in addition to the coloring pages. If you want to just color, you may want to purchase The Absurd JUST Coloring Book for Adults: Feral Fairy Tales. The Just Coloring version has 30 coloring pages, but no stories or activities, and all of the designs are single-sided.